Wow! 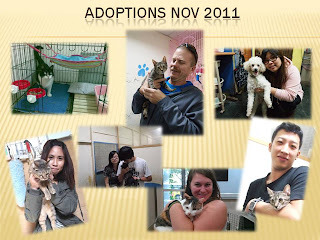 November has been a jam packed month, with many rescues and quite a few adoptions as well as worthwhile events. Remember Christmas is just round the corner and we still have our facebook flea market page as well as now a second hand book page too. Our last Grandma Nitti’s flea market for this year will be on December 17th From 4pm to 10pm. Also Animals Taiwan is putting out an appeal for any one who could donate a large refrigerator. One of ours has just broken and with Chinese New Year quickly approaching we’ll need one for the long holiday. Please contact our centre 02-28338820 if you can help in this area. Mare who has been fostering Kiki, one of our blind cats, for a long time has decided to adopt her. Kiki has become one of the family and Mare couldn’t imagine her home without her. We are so happy for Kiki and know she’s in very good hands. Denise who is Mistletoe’s foster mommy has also decided to adopt Mistletoe. Mistletoe was always a reserved and shy cat, but since living with Denise she has opened up and is becoming a loving house cat. Denise will be moving back to Canada next year and we’re looking for someone who would be able to take Mistletoe back to Canada for her. Melody has also finally been adopted. Melody came up to us during a CNR project in the mountains. She’s been with us for a few months and has finally found her forever mommy. Three more kittens have also found loving homes Puma, Zoro, and Sasha. We are so happy they have all gone to great homes where they will be loved forever. And we are also so happy to announce that Henry the Poodle has gone on a tryout. Little Henry has gone on 3 tryouts so far and none of them have worked out for various reasons. Poor Henry never gave up though, he always has high sprits and greets everyone with love and kisses. He is the perfect companion and even though he is a senior dog he has a lot of energy and love to give. We hope this tryout goes well and Henry has finally found his forever home. Three kittens were resced from an area near Sun Yat Sen Memorial Hall. We’ve named them Domino, Checkers and Ace. They came to us with Otodectes and Ascarid, but after medical care they are doing well and are very healthy, active and friendly. They now looking for forever homes. One of our TNR volunteers rescued two wonderful cats Chien Chein and Xiao Dai. Poor Chein Chein was a victim of a car accident but after medical care and love and attention he has recovered well. Xiao Dai had a serious eye infection which has left her blind, but as we have seen with our previous rescues this doesn’t hold her back. They are both very loving and affectionate cats and are now waiting for that special person to take them home. SanBan was rescued from a TNR area in Taipei. She was found bleeding with a broken leg. Her leg was too badly hurt to heal so it was decided that she would be better off if it was removed. She has recovered well from her surgery and is now healthy. She is still a little wild but we are working with her to help her become more friendly and loving. We hope after a while she’ll settle down and we’ll be able to find her a loving home. Hannah the Husky was rescued from a TNR area where people where feeding her but she was very thin and malnourished. She’d had a litter of five puppies about a month or so earlier. Four of the puppies had already been taken by people which just left one, Cartier. Cartier was taken into foster care and has already found a happy home. 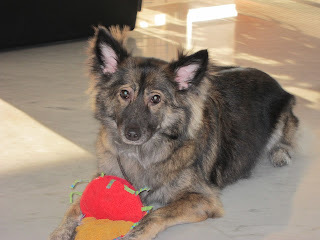 Hannah has now been spayed and is ready for her forever home. She’s super friendly to both people and other dogs and we’re sure she’ll find a home soon. Baily the Border Collie/Collie mix was found wondering round a department store. He was very nervous and had no collar or microchip. He’s been neutered and vaccinated and is now looking for that loving home. He’s still a little nervous but has no aggression. Four more kittens were rescued from a bus station. They are super friendly and loving. They are all healthy and we’ve named them Ramese, Kesi, Mesi and Tux. We know they will find loving homes very quickly. Van Gogh was rescued a month or so ago by a lady and he’s been on several adoptions. However, because he was scared and not sure of his surroundings he was a little protective and could sometimes snap at people, so he was then sent to the Ping Shi shelter. We decided to put him in foster care to see if we could adust his temperamen. After a couple of weeks of foster care he has settled down well and now doesn’t snap at all. He knows what he is allowed to do and is a very loving dog. Van Gogh is a one eared red poodle. It seems he was born with only one ear and this could be a result of the bad breeding that goes on in Taiwan. We know Van will find a loving home soon. A very sweet tiny kitten who we’ve named Alina was rescued while one of our volunteers was doing TNR. She’s very sweet and healthy and we know she’ll be snapped up soon. A poor little doggie was hit by a car and has been severly paralyzed. He was very close to passing, but a couple of very kind volunteers helped him recover, but they soon realized they had taken on too much and couldn’t afford his care and also the time it takes to care for him. So they decided to take him to Taipei City Shelter. We have good relations with the shelter and we were called in to see if we could offer any help. We decided to do all we could to help this little boy.He is now at the centre under daily care. He has very bad open wounds on all his four legs and is unable to stand by himself at this point. We are looking into getting a specially made wheelchair for him. We will keep everyone updated on his progress. North, South and West have gone into foster care and we hope with a little one on one attention they will soon find a loving home to call their own. Not all our rescues go our way and we have some sad news this month. A dog paralyzed from the waist down and with very swollen legsand paws was noticed lying in a park by one of our volunteers. He was taken immediately to the vet for care. Unfortunatly after 2 days of intensive care at the vet he still passed away. He was too weak and his injuries were too severe. We know he is in a better place now and we hope he felt loved and cared for in his last few days. A little pup was caught during a CNR project. He was found to be very weak and had a neck injury. On further investigation it was found that he had a rubber band stuck around his neck, which had caused a serious infection and had damaged his windpipe. Unfortunately the little boy was too weak and tramatized by the injury and passed away during surgery. During November we completed 90 cat TNRs. During the winter months we will see a slight decline in cat TNR as we need to make sure they are healthy and well before they can be caught and released. This brings the total since April up to 943. Also during November we have completed 5 female and 8 male CNR dogs. CNR for dogs is always lower as we need to have space for them to recover before releasing them. We’d also like to say a huge thank you to Nestle for their continued support of dog and cat food for our CNR/TNR projects. We wanted to rescue a dog. I had just quit my job as a journalist in Singapore when we moved to Taiwan in April 2008. Trapped at home while my hubby Mun Yew slaved at work, I thought how nice to have a dog for companionship. I could take it with me on my hikes up Elephant Mountain or when I popped down the street to the Wellcome. We had a look at the pet shops on Keelung Road and were quite taken with the puppies. But deep down, I felt it would be much better to give an abandoned dog a home. That’s how we found ourselves at the Animals Taiwan shelter in Beitou. It was our first time in any sort of animal shelter. The dogs were frantically barking and leaping up and down. Some had their legs amputated and were scurrying around in wheelchairs. None really caught our eye but as we were leaving, Mun Yew spotted a long-haired dog that looked like a wolf. She stood on a table, high above the other dogs. She was calm and did not bark at all. When they took her out of the pen, she didn’t acknowledge us at all. “She’s a very shy dog,” said Arnold, the young volunteer there. “She’s not a dog dog.” What did that mean? She doesn’t like other dogs, he replied. We later found out she didn’t even like people. In fact, she’s terrified of strangers - as well as umbrellas, suitcases, and anything that’s made of black leather. She had probably been cruelly abused. Moby was found by animal rescuers in Jinshan with a broken leg. She was tied to a tree and left to die. With the two of us, from day one, she has been the best dog in the world. But if someone comes to our apartment, she goes beserk with fear. In the park, she tries to attack other dogs. At the vet, we have to muzzle her. I can’t take her up Elephant Mountain. I don’t even dare take her to the Wellcome. We took her to Dr Dog, the training school. And quit after two classes. We bought celebrity dog whisperer Cesar Milan’s books and watched his TV show. Then came Angus, our Taiwanese dog trainer. Except he doesn’t train dogs, he trains owners. Be the pack leader, he would bellow in Chinese. Don’t spoil her. During each session, we would make progress. But after he left, we were inconsistent. I hand fed her if she wouldn’t eat. Put her on my lap when she was upset. I flunked as an alpha male and Mun Yew was only marginally better. Three years on, Moby has made some progress. She eats only after we give her the OK signal. She knows basic commands like “stay”, “rest” and “ball”. She never jumps onto the sofa or enters the bedrooms. She’s always so happy when we come home, relieved we haven’t abandoned her. But she still goes berserk when someone comes to the house. She still attacks small dogs in the park. She’s not the type of canine companion I had in mind when I harassed the hubby for a dog. But through her, I’ve learnt to be more patient, more disciplined and more accepting of little flaws. I’ve learnt that you don’t always get what you want but that life can be more interesting and fulfilling because of that. And, best of all, our dog’s brought us closer together. We set out to rescue a dog but in many ways, Moby rescued us. Sunita and Mun Yew moved back to Singapore at the end of 2011. They took Moby with them.